A number of Timbuktu’s sacred tombs are now gone, reduced to piles of rubble. "Repugnant" is how Irina Bokova, director-general of UNESCO, has described the vandalism. "There is no justification for such wanton destruction. I call on all parties engaged in the conflict to stop these terrible and irreversible acts, to exercise their responsibility and protect this invaluable cultural heritage for future generations." Still in danger are the pyramidal structures of the Tomb of Askia, as well as other religious and cultural artifacts, including 1,000-year-old Islamic manuscripts. The manuscripts — a testimony to Africa’s written history — are specific to West Africa and unique in the Islamic world. The United Nations has now placed Timbuktu and the Tomb of Askia on its List of World Heritage in Danger. Ansar Dine’s threats to destroy more have brought Fadima Diallo, Mali’s minister of culture, to tears. The African Union called its actions "criminal." The new chief prosecutor of the International Criminal Court, Fatou Bensouda of Gambia, has warned that her office will open an investigation into what she calls "war crimes", under the Hague Convention of 1954 for the Protection of Cultural Property in the Event of Armed Conflict. The destruction in the fabled city follows a deepening crisis in the region since a military coup in Mali’s capital in March. 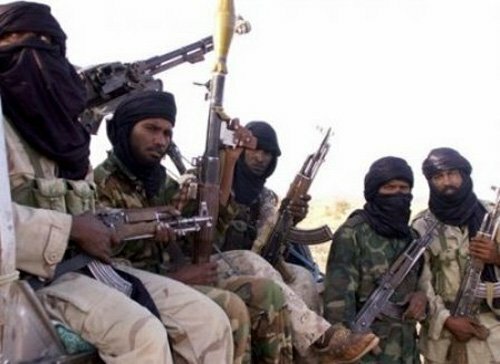 Separatist Tuareg rebels took advantage of the instability to proclaim northern Mali an independent state. The Ansar Dine ("Protector of the Faith") then in turn ousted the Tuareg rebels and took control of Timbuktu. The UN Security Council has condemned the group’s destruction and threatened to impose sanctions against it. The Economic Community of West African States (ECOWAS) is seeking the Council’s support for an armed intervention to regain control of northern Mali.